Penina stands out among the golf resorts of the Algarve as a truly epic destination, being one of the best resorts in not just Portugal, but all of Europe. The place is a rare meeting of unparalleled 5-star accommodation and world-class championship golf. Although there is a wonderful 9-hole Resort & Academy courses on site, the headline course at Penina is the Championship Course. Host to the Portuguese Open 9 times, it holds a place as one of the most historic golf courses in Portugal and is commonly ranked among the country’s top tracks. Set in the Western Algarve, Penina benefits from year-round sunshine, a real golfers paradise that is easily accessible by flying into Faro Airport and making the 40-minute drive to the resort. The Penina Resort is the definition of all-encompassing, as well as the three golf courses there are a host of on-site activities on offer, including; tennis, cycling, archery and watersports in the summer. Of course, you will want to relax and indulge on your perfect golf holiday, the resort boasts five restaurants and two bars, offering a stunning array of cuisines and cocktails for you to sample. When it comes to resort golf breaks in Portugal, Penina is as good as it gets. 1 Free Dinner for stays of minimum 7 nights. Valid for travel dates until 31 October 2019. For Travel Dates between 18th June 2018 - 15th September 2018, 1st November 2018 - 1st March 2019 & 29th June 2019 - 23rd August 2019: Daily Golf On Penina Championship Course. Opened in 1966 and designed by Sir Henry Cotton, Penina's Championship Course was the first golf course built in the Algarve. The Championship course has been host to the Portuguese Open eleven times, and is also a regular stop for the European Seniors Tour. Originally built on rice paddies, the 6,869 yard course is by and large quite flat but is set amongst mature trees and shrubs, with each of the fairways lined with impressive woodland. As a result of the mature setting of the golf course, accurate shot making is required to score well on the par-73 Championship course. The 7th is a hole which combines risk with reward, with many golfers opting to play short of the water which cuts across the fairway, this will bring a longer iron into a small undulating green. Those wanting to hit a driver can find themselves with a much shorter club in but run the risk of finding water. The nine hole par-35 Resort course sits close to the Championship Course and provides golfers the ideal opportunity to hone their skills. The course takes advantage of a lake to provide an interesting and satisfying round and has all of the same characteristics of the Championship course, with tree lined fairways that require accuracy above all else. In addition to the Championship and Resort golf courses, the Penina Resort also offers the Academy Course. Previously named the North Course, this 9-hole par-30 "Executive" course features 18 tees and makes full use of a number of lakes and sand hazards making it an enjoyable course that tests the skills of all abilities. The Championship's short 13th hole is ranked in the world's top 500 holes, with water guarding the front of the green. Penina's excellent tennis academy has 6 tennis courts where you can take part in lessons and clinics with the resident professionals, while the FIFA certified football pitch has attracted teams of the caliber of Chelsea. Activities include circuit training, mountain biking and archery, while during the summer months the Beach Club is the place to try water sports such as wind-surfing, water-skiing and sailing. Note: The Penguin Village Kids Club is only open from Easter until end of October. Staff welcoming. Nothing is too much trouble. We were looked after really well. Great hotel friendly staff all round had a fantastic time. Would prefer a room overlooking the swimming pool, Breakfast is superb, the bar snacks are less tasty and a bit pricey. The hotel was very welcoming but a bit like an "old folks home" in the public seating and bar area. Being off season, some to the facilities are closed. ie. swimming pool. Staff were great. Compared with nearby Alvor (10 Euro taxi away), prices in the hotel for food and drink are more than double. The Grill was good quality fare. Room was small but very comfortable and spotlessly clean. The bathroom looked like it had been very recently replaced and to a very high standard. Easy to see why some people have been going to this hotel every year for 30+ years. I would return. Six or seven years since our last stay and in a good way little has changed, a comfortable enough mountainside room with pleasant staff and good breakfast, it really does what you expect with no fuss. Very clean and pleasant, really enjoyed. Very well looked after on arrival and that continued for the 4 days we were there. Staff very helpful and polite and overall hotel experience was very good. Very enjoyable stay- although there was no entertainment in the hotel any evening - or none that I was aware of! Only negative - I was amazed & v disappointed that a hotel of this standard does not supply complimentary drinking water in hotel rooms. Hotel is comfortable, if a bit tired and old fashioned. Service is a bit inconsistent, slow at times and very helpful others. Worst feature is the anachronistic dress code in the Grill. To ban shorts in a golf hotel in hot weather is simply stupid. On the first evening of our stay we were in danger of going hungry, we were all showered, dressed in tailored shorts and shirts. Bennett entry to the restaurants and only after demanding to see the duty manager, we were ‘allowed’ to eat outside on the terrace. Not acceptable in this day and age. Visitors need to be warned in advance. Needless to say we eat out on the remaining nights of our visit. This is a very nice hotel with a very pleasant atmosphere; virtually everyone there was a golfer. I would question its 5 star rating. It felt more like 4 star, maybe plus. The single rooms were quite small and the furnishings a little crude, although everything needed was there. Like every hotel I have stayed in, the plumbing was in need of serious attention. Tap flow rate was very slow and the hot water came out brown for the first day. It took five minutes for the sink to drain. However, the bidet was brilliant for cleaning my golf shoes! Overall it was a most enjoyable stay for my first golfing trip abroad. Our group stayed at the Penina resort between the 25th and 30th of September and consisted of four male golfers and we were joined by two of the wives for the last couple of nights. This was our first visit to the resort and we were overall quite impressed. There is definitely a quirky old charm about the hotel. It feels dates but not in a bad way. There are some modern touches in the rooms which are of a good standard.Rooms cleaned each morning. What stood out for me was the friendliness of almost all of the staff. Bar one rude lady working in the spa and the way she spoke to our wives about a booking they had made. But otherwise the staff were exceptional. Good was good especially the breakfast and at the Henry Cotton restaurant and bar. One evening meal at The Grill was good but very overpriced for what we had. The swimming pool was excellent with a huge pool and plenty of sun beds available. Location of hotel is excellent some 10 minutes taxi ride to Alvor that had some superb restaurants and bars, especially suited for our age group with no sign of any hen or stag parties. I would deffinately recommend this hotel for golf groups. Staff were attentive and friendly. Breakfast choices and Italian restaurant were first class. Make sure you find out which bar is used for the happy hour - 6.15 to 7.15 every evening! Nicely sighted room but very small- wardrobe was right beside bed - classic problem of no plug near a mirror with a chair for my wife to dry her hair- most hotels fail this test- not possible in the bath room as too steamy after shower. Breakfast reasonable but not 5 star -cold meats poor - pancake maker brilliant. Prices in the bar were very expensive. Championship course is tired and jaded and I guess it’s the time of year but hopelessly busy -waiting every shot - very difficult to play golf like that. €50 for a buggy is a bit of a joke. Resort course was actually more playable but a bit simple. Hotel still has a lovely feeling of luxury about so enjoyed that and wilperhaps return for that but not the Golf. My caddy tip: "Don't go too long off the first tee. Watch out for the water on the Third. 2 wonderful golf courses to enjoy. Favourite hole: 5 hole is my favourite a par 5 with a stream diagonally across fairway and a pond front of elevated green. If you are concerned about pond play second shot to right over stream then third easier shot over pond to green. My caddy tip: "Positioning your shots left or right makes approach to green easier. Trees and water often come into play if you take the wrong line." My caddy tip "It is a tougher course than you think". Brilliant service from Your Golf Travel. My caddy tip - "Bring insect repellent"
Favourite holes - The short holes on the second nine. My caddy tip - "Steer well clear of the water particularly on 2nd 9"
The courses are generally gently testing with helpful staff in the hotel. My caddy tip - "Pick your tee shots and lines carefully." My caddy tip - "Don't always use your driver"
Great place to stay and play. My caddy tip - "Be prepared to lay up-lots of water about"
My caddy tip - "Think before bombing it off the tee." My caddy tip - "Position off the tee is important." My caddy tip - "Again quite a few longer holes require precise position off the tee". Lots of water on the course. My caddy tip - "Take a course planner for distances." Thoroughly enjoyed all the holes. Punishing if you are not accurate. A challenging course, with some holes particularly tough! My caddy tip - "Keep your wits about - keep focused." Stableford score - 28 or less. Handicap - 36 or more. Difficult course if you are a beginner or high handicapper. Many large ditches to cross and a large lake but flat. Better for low handicappers. Long course but is a good challenge for your course management skills. Favourite hole - 7th - best to lay up and leave a full wedge or nine iron into the green. My caddy tip - chose 1 more club. Course appeared a bit tired - bunkers and greens needed rolling but the holes were very interesting. The holes are very narrow but overall a relatively simple course. My caddy tip - "Your ball won't travel as far you expect." Stableford score - 39 or more. Don't take unnecessary risks but if the chance is there take it. Favourite hole - 18th hole - believe in your game and go for it. My caddy tip - "Take plenty of balls". My caddy tip - "There is not a lot of room on the fairways - keep it straight at the expense of some distance"
A lovely set of par 5s. Favourite hole - Hole 5, Play tee shot to the right of fairway , avoiding the bunker right which opens up the fairway to play short of the water infrontbof the green for 2 and then play over the water for 3 and try for a birdie . Fun hole ! My caddy tip - "Keep the ball on the fairway"
My caddy tip - "Play within yourself - trouble awaits if you are too ambitious." My caddy tip - "Very busy so be prepared for a long round." Very easy to lose balls if you are not accurate. My caddy tip - "Take more club than you think". Favourite hole - 6th hole. My caddy tip - "Keep the ball out of the lakes". Clever play is just as important as hitting it long. Favourite holes - 12 and 16. My caddy tip - "Use your handicap shots wisely." My caddy tip - "Keep the ball on the fairway". Favourite hole - 9th hole. Favourite holes - 1st and 18th. My caddy tip - "Keep the ball straight"
My caddy tip - "Keep away from the water." My caddy tip - "Accuracy off the tee." My caddy tip - "Great course, very challenging - take extra club." Favourite hole - 9th hole - take another club for the approach to the green. My caddy tip - "Expect a long round, too many people on the course." Favourite hole - 13th is a superb hole off the back, requires a committed swing to a well guarded green, if you have a stroke use it well. My caddy tip - "Be patient and wait for your chance to attack." My caddy tip - "Know your players capabilities. Some require lay up if not sure of carry." Penina is an excellent colonial style hotel with a fantastic breakfast to start the day. Best on Algarve. Course is good for those walking with a blend of challenging and opportunity holes. 5 mins from Alvor nightlife. Staff are fantastic. My caddy tip - "Keep it in play and take cash for the mobile beer vendor "
My caddy tip - "Don't feel intimidated, if you think your way round you will record a good score." My caddy tip - "Don't push too hard, look where you want to put the ball." My caddy tip - "Don't try the impossible shot." My caddy tip - "Short and straight, if you're in the rough its very hard to find the ball." My caddy tip - "Course management is key and know your yardages." My caddy tip - "Go by the yardages and then take a club up." Be committed with your approach play. My caddy tip - "Bite your lip and take on an iron." My caddy tip - "Be careful of the water". My caddy tip - "Be ready from the start, hole 1 is a tricky dog leg." Good course management skills are needed. My caddy tip - "Play sensibly. Think about your tee shots and where you need to hit them." Accuracy is a must if you want to score low. Favourite hole - 14th, ensure a good drive, lay up and then wedge into the green. My caddy tip - "Never try to over hit shots." Favourite hole - 9th hole, driver and wood are needed. My caddy tip - "Play within yourself - take 3 wood instead of driver when playing the par 4s and 5s." My caddy tip - "Keep it on the course". My caddy tip - "Keep your drives straight". My caddy tip - "Just enjoy, 17 also plays longer than it looks". My caddy tip - "Play to your strengths and use your handicap to help you round this challenging but likeable course." The tee shot is crucial on all holes. My caddy tip - "Keep the ball in play off the tee." My caddy tip - "Just enjoy and get use to the different types of grass." My caddy tip - "Keep it on the fairway, beware of ditches." My caddy tip - "Don't underestimate this course". Thoroughly enjoyable round of golf. Every hole is a good golfing hole, take a course planner as positioning is key for the next shot. My caddy tip - "Get in position for next shot." My caddy tip - "Trust the yardages". My caddy tip - "Take one more club". My caddy tip - "Be patient". My caddy tip - "Plays longer than it looks". Punishing off the tee if you are not precise. My caddy tip - "A ball off the fairway will usually cost you a shot". Distance is not as important as accuracy. Know you yardage with every club. Enjoy each and every hole. Favourite hole - Enjoy all the holes, 17th least favourite as it is a long boring slog. 5th most challenging. Take plenty of balls and think your way round. My caddy tip - "At this time of year always take ore club as no run on the fairways." Very comfortable slightly small room . Service very friendly. Very efficient in restaurants. Breakfasts delicious and room spotless. For a golfer excellent facilities. Courses well looked after and greens fast.very good practice areas. As winter season no swimming pool and reduced restaurants. Not much for non golfer. My caddy tip - "Watch out for the dog leg left and slope at halfway". My caddy tip - "Don't panic". My caddy tip - "Have your "A" game with you, the course is longer than you think." Very long with minimal dog legs. My caddy tip - Its a long flat course but keep it straight. The thing I liked about all the holes is that they were all straightforward and visible from the tee. It makes it a lot more enjoyable when you are playing a course for the first time when you don't have to ponder about blind shots. My caddy tip - Beware of the small hazard ditches on the first 9. Watch out for the water hazards off the tee. Hole 12 - Your drive must be straught and take extra club for the second shot otherwise you will be short and in the water. My caddy tip - "Go for accuracy rather than distance off the tee." Accuracy is imperative if you want to score. Favourite hole - 5th hole. My caddy tip - "Keep it on the fairway, if not you may not have a shot". Everything in the hotel was very good, all our group enjoyed the trip. My caddy tip - "Bring your A game." A good mental challenge as well as a test of your golf. Favourite holes were HOLES 2,9,12,& 18. My caddy tip - "Think about your next shot." All good rooms, rooms were small compared to modern hotels but all good. Favourite hole was the 18th. Tips- If you need a buggy book well in advance as they do not usually have enough buggies for everyone. Hotel is good if a little tired in appearance. My Caddy Tip - "Course management is the key. Play within your ability." My Caddy Tip - "Most greens are subtly built up higher than the fairways, so one more club than your yardage suggests is usually required!" Hotel was very good but the golf course play tends to be very slow. My Caddy Tip - "Course management is key." Old style hotel, no longer 5 star with closed outdoor pool (no indoor pool). My Caddy Tip - "Beware of stagnant water hazards ." 16, 17 and 18 all great finishing holes. My Caddy Tip - "Keep the ball on the short stuff. You do not always need a driver or need to go for the green on par 5s." My party hasn't yet found anywhere to rival the total package at Penina. It's a very good hotel, a very good course on site and a proshop which looks after your clubs and shoes for the whole visit so avoiding the need to lug clubs up to your room. The course has many very good holes that give you options in club selection and risk/reward choices. For me, the 5th, 7th, 9th, 11th, 12th and 18th all challenge golfers over a wide range of abilities. A beer and a sandwich after the round on the beautiful terrace followed perhaps by a dip in the excellent hotel pool will set you up for an evening out in the local village of Alvor where there are a number of good restaurants and bars with live music. Penina is no longer at the fashionable end of courses in the Algarve, but for me it still offers a great venue for an enjoyable few days of golf. My Caddy Tip - "Don't be too optimistic in trying to reach some of the greens in 2 unless you are on top of your game. Instead, lay up before the water on the 12th unless you've creamed your drive." The 12th on the Championship course off the whites is excellent. The second shot is further than you think. Take one more club! My Caddy Tip - "Always play within your abilities, don't take chances. Play to were you can see..."
Hole 12 is one I rarely par. The hotel, with new management, is even better with great staff & varied places to eat. My Caddy Tip - "You will score better with a game plan." The hotel is 5 star in every sense, as is the main golf course. Championship Course is fantastic, hotel was lovely, staff were superb and a pretty good value trip too. My Caddy Tip - "Find the fairway if you want to score - lots of trees and water hazards!" Enjoyed the course, hotel and facilities. Play was occasionally slow on three days due to too many people on the course. My Caddy Tip - "Take plenty of water, hire a buggy as it's a long day." My Caddy Tip - "Practise putting." The 18 hole course is superb, the 9 hole is great for a practice round. My Caddy Tip - "The greens are very fast and it's tough to stop the ball." Rather a lot of water on the course, so didn't see it at its best. My Caddy Tip - "Play the course adjoining the hotel." Enjoyed the par three holes. My Caddy Tip - "Take club more than you think." Warm atmosphere, friendly staff, tough but fair course. My Caddy Tip - "Always take a longer club." Very nice place but do take a taxi into Alvor as it is a really nice place with lovely beach, board walks and restaurants. Hotel and food was good. Lovely hotel. If you can afford the upgrade, your room will be facing the swimming pool and golf course, which is a lovely view. Staff were very friendly and the golf course was enjoyable. The hotel has a good standard of restaurants and at the Alvor, the hotel has a section of sunbeds, etc. for people staying at the hotel. If you fancy a night out in the Alvor the taxi is around 10 euros each way. My Caddy Tip - "Keep it on the fairways." 9th hole was fantastic. Take a course map with you you will find it useful. The hotel was excellent. My Caddy Tip - "Don't use a driver on 10th." Take enough balls as there is plenty of water and places to lose them. Staff very helpful and happy. My Caddy Tip - "Do not over club." Good test of golf and the hotel was excellent. Golf bar and food area shambolic. My Caddy Tip - "Think your way round, don't boom it. Position is key everywhere." My Caddy Tip - "Practice putt first." Challenging course and buggies are a must. All good. Leave your clubs with the store staff and they will put them on the buggie each day. Hotel was first class as ever. Exceptionally busy and course has signs of overplay, particularly the greens. My Caddy Tip - "Take a ball recovery tool for the water." Championship course is a good test of golf and you are punished for not being accurate, but rewarded for finding the fairways! Resort course ok, but not to the same quality. Hotel was good and top quality buffet breakfast. My Caddy Tip - "You must find the fairways and will be punished if you spend time in the trees!" My favourite hole on the course is the 9th. Penina is a course you have to take your time on and not try to many smart shots. The hotel in general is great with good staff, many of which we know having been there for breaks in the past. My Caddy Tip - "You have to get the ball on the green without a bounce and hit slow approaches to the greens. Lookout for subtle breaks on the greens." 13th hole was a challenging par 3. Unless you're 100% sure you can clear the water, lay it up! Hotel was good apart the fact that there were no balconies for some of the group. Also, the mini bus into Alvor was too small and too limited with times, although I believe this had just changed prior to our arrival. Food was fabulous. My Caddy Tip - "Make sure you have a trolley as I would hate to carry a bag round here!" Playing the Resort course (9 holes, 18 tees) is a bit easier and buggies were allowed on this course, as oppose to only being allowed on paths as they were on the Championship course. Although we had heavy rain at the start of our week the courses held up quite well. 12 and 13th great water holes. I didn't have any favourite holes and just enjoyed playing. Hotel was good. On the first hole, you need a good straight drive to have any chance of hitting the green in two. Hotel very nice, staff very friendly and helpful. Hotel was good for golfers but not 5*, overall the course was very good. My Caddy Tip - "Accuracy over length." The 5th hole par 5 is my favourite and the positioning of the drive and the second are critical if you are to get on green. Water in play diagonally across fairway and large pond in front of green. Smart play is to play right on the second shot, giving an easier third pitch to the green. My Caddy Tip - "Think about club selection to give optimum position and distance from trouble, allowing for a shot to the green." 10th hole was always challenging but very rewarding if you par it. My husband and I think it is one of the best courses we have played on, no matter how many times we have been there. Every time you play there, there is always something different about each hole on the course. Hotel, accommodation, food and service all first class. We always enjoy having a room facing the course, as to look over the course in the morning the view is outstanding. Well done Penina for keeping up your standards. My Caddy Tip - "Make sure you go to the range first and practise but leave enough time to practise your chipping on the green." Favourite hole was the 16th. Take at least one club more. The hotel is what you pay for with a smile. My Caddy Tip - "I would use a driver on ten and the greens are fair." Hotel was comfortable. Breakfasts were very good. Probably a good idea to pay extra for a room overlooking the course. My Caddy Tip - "Course fairly straightforward. No major advice needed." No particular favourite hole, liked them all. Hotel was fantastic, food and service great. Enjoyed the Championship golf course but the Resort Course was not in great condition. My Caddy Tip - "Don't use driver often and try to keep the ball on the fairways as they are tree lined, so tight." The 9th was my favourite hole. My Caddy Tip - "Go to the range before you start." Lots of great holes and a good test for low and high handicap golfers. My favourite hole is the 18th, a good par 5 with the hotel in the background. My Caddy Tip - "Stay in the fairway, play conservative and remember the greens are very true." Nice hotel and you can great great views if you're lucky enough to get a room overlooking the golf course. Seems to be living a little on past history and needs to be brought up to date. Rooms dated & in need of redecorating. Breakfast was ok but not with lots of choice. The main meal was ok, but very limited. Golf course great and in good condition bearing in mind the amount of traffic. Staff very good and always ready to help. Area around the hotel very nice & relaxing. My Caddy Tip - "Course management is a must. Greens have very subtle breaks you cant always read, so don't just grip & rip." The courses were nice, and the hotel looked after us very well. A good resort course, a short taxi ride from the nearby town. Always use a bigger club than you think. Like all the par 3's. Perfect hotel for golfer, no travelling to the course, hotel food always good. In fact our favourite place in Europe. The course is a bit untidy and needs more love. Classic designed course, pretty tight in parts with tree lined fairways. Great course, superb sand in bunkers and a great pro on site. My Caddy Tip - "Better to take a long iron or 3/5 wood off the tee than a driver." 12 was an excellent hole. I would look at the hole layouts carefully. Very good trip. My Caddy Tip - "Make sure you avoid the water." Hotel great. Service very good and staff friendly. Breakfast excellent. My Caddy Tip - "Just play your own game. Enjoy it all and lay up at some holes." Second, twelfth and thirteenth were all excellent! Usually take one more club as greens tend to be slightly raised. My Caddy Tip - "On the second hole, unless you are past the 150 metre post, do not go for the green." Hotel is great. Course is lovely. My Caddy Tip - "Stay straight and don't be too aggressive on the water holes." Great if you want to be based in one location. Course was in really good condition. Hotel clean and tidy. We were on bed and breakfast basis which was excellent. However, the resort prices for food and drink outside of the package were a bit steep. Most nights we caught a taxi to Alvor and dined there, where the meals are better value. My Caddy Tip - "Use the great practice facilities to warm up before your round." Hotel is great but only has an outdoor pool. Great views of the course from rooms at back of property. A longish walk into Alvor but taxis were reasonable. My Caddy Tip - "Always select the shot that keeps it on the fairway." Fabulous, old style 5* hotel with great food. Enjoyable course. My Caddy Tip - "Some greens need all of your attention before you putt, be sure and check the line." A number of good holes, like the second. Hotel nice and traditional with good service. My Caddy Tip - "Keep patient and straight from the tee!" The hotel offered a variety of dining options, relaxation options, beautiful surroundings and golf all within easy walking distance. Challenging holes across the water. Very challenging course for most golfers but fair with no blind shots. Greens where in very good condition. The course was slightly disappointing having had some high expectations. Although the holes were well designed and interesting it was a bit scruffy when billed as a championship course. I have played many better courses in the algarve. Having said that, the hotel was well situated, the rooms decent and the staff were friendly. A good base and we played Palmares on the coast which was excellent. You will never find balls in water, so bring plenty!!! My Caddy Tip - "Play one club more than usual." We have been to Penina several times in the past, and have always found it to be one of the best golf courses in Portugal. The hotel is efficiently run, the staff are very friendly and helpful, the food exceptional, and the hotel itself very clean. We find playing a couple of days on the Resort Course, in between challenging golf on the Championship course, quite relaxing. My Caddy Tip - "Try to get an early tee-time." My Caddy Tip - "Lay up if you're not confident of your distance." Nice hotel, excellent restaurants, friendly staff. My Caddy Tip - "Don't be short on your approach shots"
13th was a brilliant hole- par 3 over water. My Caddy Tip - "Play plenty of club"
The hotel was very nice, with a decent room. The restaurant for evening meals was excellent, as were the lunches and snacks in the clubhouse. The staff in the hotel, in the pro shop and on the course were generally very friendly. There was only one sour note of being told to hurry up by a marshal on the course, when we were being held up by two guys who we'd been paired up with by the start marshal. If possible, I would go as a group of four so as not to be paired up like this. As far as the courses are concerned, there was really only one when we went in March/April because of water lying on the fairways. It's cheaper, but it really doesn't stack up against the quantity and quality of Vilamoura courses, the only other Portuguese venue we've tried. Great service in hotel for golfers (cleaned shoes, brought clubs out for us), choice of two courses - one easier, one championship. It was difficult to remember the holes from 4 years ago, but I nearly got a hole in one on a par 3 and just missed a trip to Las Vegas! My Caddy Tip - "Tricky water hazards on some holes, so lay up if you're not sure of carrying it." The famous 17th was great! A lot of ditches with muddy water - lay up or be confident that you can carry the hazard. Hotel being on site was excellent. My Caddy Tip - "Play your normal game. Know the distance you hit the ball with each club." Love the hotel, especially that it is right at the course. The Resort course is worth a visit. The 9th is my favourite hole on the BIG course! The staff are very helpful both in the Pro Shop and in the hotel. Rooms are a little small but for 3 days they are fine. A wonderful 3 day venue. My Caddy Tip - "Lake on 12 is quite wide - lay up"
I marked it a 4 because the course was wet because of the very wet weather. Also, there was a very noisy group of men who spoilt the atmosphere, the staff really struggled to shut them up. My Caddy Tip - "Go for it!" Just a great course and hotel. Poor behaviour by some English golfers. It had rained heavily in the morning and tees were doubled on the back nine. The English chaps behind could not work this out and were very abusive. I would not go again. Special occasion too for my wife. We first went to Penina the year after we went to Mauritius (Belle Mare Plage). Better than Mauritius and a lot quicker to get to too. My Caddy Tip - "Be accurate or take lots of balls, not a long course off the yellows but play steady." On 13 you must commit to your shot. My Caddy Tip - "18 plays as a par 5 so don't go for green with 2nd shot. It plays 40 yards longer than yardage." The Acadamy course was always free and good for practice. The Championship course was in superb condition. My Caddy Tip - "Stay straight!" Par 3s excellent. Food was great. Location was very good and close to alvor which has some great restaurants very reasonable priced. My Caddy Tip - "Greens are tricky but I enjoyed the golf"
My Caddy Tip - "Buy your water and Mars bars before you play. Prices on the course are a rip off." Favourite holes were 2 and 13. The hotel was good as ever, not the cheapest, but quality is excellent, especially in The Grill. My Caddy Tip - "Take 2 extra clubs on most approach shots." Hotel was an enjoyable traditional Spanish one, which helped us enjoy the break. Wonderful hotel specifically tailor made for golfers. The hotel staff were superb...a great feature. The golf course was in excellent condition for November after torrential rain. A brilliant destination! My Caddy Tip - "Use irons until you get used to the ditches and distances to lay up"
The course was challenging enough especially the Resort shorter one. The courses were in poor condition and the greens had pitch marks on. The rooms were small but breakfast was good. Evening meal and buffet were poor. However, the staff were very friendly. My Caddy Tip - "Lay up on occasion." Best hole was stroke index 1. Hotel was everything you wanted and within a short distance of Alvor, Praia de Rocha and other resorts. My Caddy Tip - "Think about the hole, don't try for the Hollywood shot as it will bite you if you get it wrong." Stroke index 1 was a brilliant golf hole. We really enjoyed the course. It was in great condition particularly for a resort course, the greens were excellent and the pace of play was never too slow. The staff were very welcoming as they are in the hotel generally. The club house bar is nice but usually very quiet with little atmosphere. This is simply a result of the fact that it is part of the hotel and most of the residents who play go to other parts of the hotel/ pool once they finish playing. The hotel rooms were good and well furnished. The hotel in general had a nice family feel. We would definitely return and I would rate it as 4/5 as a golfing holiday. Our trip to Penina was one of the best we have had as a group abroad. The facilities of the hotel were far better than expected with an impressive entrance leading into a cool, quiet reception and lounge area then into the gardens with views over the course and a very large swimming pool. The bar was well stocked with refreshing beer and had large screen TVs for après golf entertainment. At breakfast there was a very good selection of cereals, fruits, meats and fresh omelettes made to order which set you up for the day perfectly. The members of staff were extremely helpful and friendly at all times. The Championship Course is a test for most where positioning your tee shot well helps considerably with your approach to the very well kept greens. Being slightly offline was punishing and safety was the order of the day. Overall the experience of playing both the Academy and Championship courses was a very good one and one that we hope to revisit again soon. The quality of the championship course at Penina was very good, as were the practise facilities, but the resort course could do with some TLC. The 19th hole was very good too, with first class service, as you would expect of Penina. The hotel itself was excellent, with a wonderful buffet breakfasts and evening meals at the poolside that are not to be missed. Overall I would rate our mini break 5 out 5 and would love to return to Penina next year. The Championship Course at Penina was in good condition and the other golf facilities, putting greens and practice areas etc were very good too. Members of staff are excellent, as are the food, service and rooms. After golf service is good too as is the swimming pool. The only drawback is that the course is very busy. We have been at Penina during different times of the year but as yet, we’ve not found a quiet time. Having said that, we are planning to go back in September / October next year hoping it will be less busy. My wife and I have visited Penina many times. The Sir Henry Cotton Championship Course is a stern challenge for golfers of all abilities and the lower the golfer's handicap the more the inclination to "take on" the challenge. Some courses suit players with a fade or a draw but Penina incorporates it all and we will be back. We truly look forward to staying in the hotel which is of the highest quality. Room number 361 is our room of choice! My wife loves the pool which at one time was the largest in the Algarve. The buffet breakfast is unsurpassed too, particularly the omelettes which are cooked to order. We enjoy relaxing in the bar after dinner, especially when Elvis puts in an appearance! Upstairs in the sports bar is the place to be when following the European Tour as there is a great international atmosphere. This hotel is one of my favourite places in the world! The Championship Course is well designed and extremely well looked after and the same can be said of the Resort Course. The rooms in the hotel are very nice too. We like the Studio rooms but overall would say they could have been designed a little better. The food is excellent and members of staff are superb. My overall rating? 5 out of 5. Although we booked Penina as an all in golf package for two of us, my wife is not a golfer so I only played a couple of times in the week, although I could have played as often as I wished. We think your golf packages are so well priced it is nice to just use them for a holiday and maybe play a bit of golf as an extra. The Championship course was very good but too difficult and long for me on an 18 handicap. The Resort course suited me better, although not a championship course more of a family holiday course and fun. The 19th hole is very good and the hotel almost top quality. The Championship Course at Penina is a great layout and a true test of all golfing abilities. If you are on your game you can score well so the course is very fair. I have always felt that Penina was among the best golf courses on the Algarve, if not Europe; a great design overall and in particular, the par 5's and the par 3 early in the back nine (the 12th I think) which rates as one of the very best short holes I’ve played. The condition of the course was first class too and the greens were in great condition; quick and true. It was good to see lots of staff on the course, working away. I've stayed at the hotel many times and always found the service and quality provided first class in all areas. The food is great (upgrade to al la carte for a real treat) and the atmosphere is friendly, staff are helpful and in keeping with the 5 star rating. Since the hotel’s upgrade, the rooms have been returned to the original high standard. Our overall verdict would be 5 out of 5. I'm a real fan of the whole place and I think it offers probably the best value for money in the Algarve as an overall golf break destination. Great golf, great food, great service....at an unbeatable price! I would (and do!) return...very often. Penina has a very nice hotel with 2 golf courses on-site; the 18 hole Championship course and the 9 hole Resort course. The championship course is a must play course, with the Resort course a welcome break in a week's worth of golf. Both courses are a challenge in their own right. I would recommend purchasing a stroke saver to find where the hazards are on the courses, as some are devilishly hidden from view...or was that me being out of position?! The 19th hole – the Sir Henry Cotton Bar – serves good grub and is a welcoming place for a pint or 2. Practice facilities include an excellent driving range, a chipping area and a putting green with a teaching academy also available if needed. In terms of accommodation, I would recommend the pool view option as this side gets the sun all day long; the non pool view option faces the road and although it is not noisy, it does not benefit from the sunny aspect of this 5 star hotel. The breakfasts are all you could wish for, and evening meals, whilst not cheap, are up to the 5 star billing. Members of staff are excellent; all fluent in English as well as other languages. Golf clubs are secured in the pro-shop over night and brought out for your round along with your daily polished shoes; I like being spoilt this well! The Penina Golf Resort (which is less than an hour's drive from Faro airport) offers a very stylish place to stay, together with some excellent golf on site. The small coastal town of Alvor (10 minutes drive from the hotel) is a delight to visit, offering a huge range of places to eat and also a long stretch of sandy beach. The Golf Resort is conveniently situated, less than one kilometre from the nearest junction on the A22 motorway. Penina's 'Resort Course' offers a decent golfing challenge (albeit going twice around a 9-hole course but with slightly different tee positions) and a helpful preparation for the tougher demands of the Championship Course, which is the oldest golf course in the Algarve. The holes on the Championship Course are generally quite long and many of them have watery obstacles in the shape of drainage channels of varying widths, as well as some sizeable ponds. As befits a course that has hosted the Portugal Masters on a number of occasions, the Championship Course provides golfers with a good mixture of enjoyment and technical challenge. The standard of service in the hotel is excellent in all departments. Prices for food and drinks are typical of a resort of this standard - but arguably the comfortable facilities and panoramic outlook over the Championship Course make them worthwhile. We found that the hotel was welcoming, and the bars & restaurants had a lively atmosphere that catered well for groups and for individuals and families alike. Our only suggestion for improvement at Penina is to ensure that golfers have sufficient ability (e.g. as shown in a handicap certificate) to play the Championship Course without undue delay. We did see staff (in buggies) monitoring the speed of play but it was not clear that they were actually taking any enforcement action. As a result, times of more than 5 hours to complete a round were not uncommon. Our only previous experience with YGT was at La Cala last year. Comparing La Cala and Penina, we feel that Penina's hotel has a livelier & friendlier atmosphere, while La Cala offers more in the way of golfing challenges. However, the fact that Penina seems keen to include visitors in club competitions in future may help to tip the 'golfing balance' towards Penina. We have had good service from YGT last year and this year and we would be happy to recommend you guys to others. A group of 10 friends made our second visit to Penina in early October 2014. We had been to this resort 3 years ago and came away with some great memories of the course and hotel, but this time we were left somewhat disappointed. Although the Championship course is still just as interesting, it was not as enjoyable to play because the condition had deteriorated somewhat, in particular the greens. We also played the Resort course this time around but I can only describe it as average at best. The hotel itself was of a good standard, with the only usual gripe being the overpriced drinks. With this in mind we made full use of the 2 for 1 happy hour before moving on into Alvor each night. Three years ago I would have given a 4 out of 5 rating - this year, at a push I can only give it a 3 out of 5. The Championship Course at Penina is a good test of golf for all handicaps. It’s an interesting layout and in excellent condition, especially the greens. The Resort Course has some interesting holes too, but is in poor condition, has no starter and tends to be overcrowded. The clubhouse is very welcoming though, with a friendly atmosphere and extremely helpful staff. The hotel is 5 star in all respects. The rooms, whilst being very well appointed, are a little on the small side. We would return to this venue for say a 3/4 day break to play the Championship Course and would give it an overall rating of 4 out of 5. It goes without saying that the layout and design of the Championship Course at Penina is superb. When we played, even though there had been plenty of rain, the course held up very well. As far as the clubhouse goes, from the Henry Cotton bar for a drink after our round to the restaurant in the evening, the staff are always excellent. Since the hotel was updated, the rooms are back to their best. The breakfasts are the best in the Algarve without question. The Caddy Master as always was very attentive, with storage of clubs and daily cleaning of shoes being a very useful service. The bonus in the evenings was the snooker table in the hotel lounge, which makes for some great memories. Our overall verdict would be 5 out of 5 all day long. Would we return? We WILL return! We've stayed at Penina a dozen or more times and despite our expectations getting higher each time, the hotel, golf course and staff have never failed to exceed them. The hotel is very traditional, nicely presented and the staff have an uncanny knack of knowing how formal or informal they need to be when in conversation. The golf course is wonderful and a challenge for all levels of golfers without being too ridiculous. You will certainly want to come back for more once you've played it. We’d recommend hiring a car as despite everything you need being in the hotel complex, doing so allows you to explore the east and west regions of the Algarve, as well as further inland which is far less touristy. We’ll be there again next Spring. We stayed at the Penina Golf Resort in February and the weather was sunny and warm. This time of year must be taken into consideration in our review. The Championship course was in good condition and well looked after. It was as difficult a course as you would like it to be. My wife and I are high handicap players so just playing here was special without trying to beat it. Long hitters will do well here. The resort course is also quite long for a 9 hole. Not as pristine but every bit as enjoyable as the main event. There are some tricky holes. Refreshment buggies go round both so if you need a snack or drink it's available. The nineteenth hole was all you need before and after a round, with friendly staff and a large choice on the menu. We used it often as it was very comfortable. The hotel itself is not new but well looked after. We upgraded to a front room overlooking the pool, on the sunny side of the hotel. Like in the clubhouse, the staff in the hotel are very friendly. The food and drink was a little expensive, as you would expect, however it’s well worth every penny considering how well everything is run. We give the resort an overall mark of 5 because it offers everything we need from a golf holiday. We’ve already booked another fortnight at Penina next February! I have now been to Penina on a few occasions. One of the advantages of this golf resort is that it has an excellent, challenging test of golf in the form of the Championship Course, as well as a smaller course if you feel like a lesser challenge, yet still enjoying a very picturesque course. The clubhouse is welcoming and friendly, offering light meals after 3/4 hours of golf. The hotel is first class too, with spacious, comfortable rooms and friendly, helpful members of staff. The hotel also offers a substantial breakfast which is ideal before a full day of golf. Overall, my verdict is that this is an excellent hotel with very good facilities. My rating would have to be 5/5. I have returned to this venue and will do so again. The Championship Course layout is very good at Penina. It’s very testing and was in fantastic condition. The clubhouse staff were excellent and were there to answer and deal with all our needs, all of which was done with a smile on their face...nothing was too much trouble for them. The hotel is 5 star, and the services and staff are fantastic. We’d rate our trip as 5 out of 5 most definitely and we will return to Penina in the future. We had an excellent week at Penina. We found the championship course challenging and with so many hidden water hazards, there were many balls lost! It was in very good condition and interesting to play. The club house was great too. Our clubs were stored over night and ready for our tee times in the morning. All members of staff were friendly and helpful. The hotel was very comfortable. Its traditional style made it spacious and large public rooms easily accommodated the large number of guests. My only small criticism is that there was no free bottled drinking water in the rooms and to buy a small bottle was 2€50. We would choose a different resort next time simply for a change of area and golf course. Last year, in the spring, I travelled to Penina with two pals for a short golf break with Your Golf Travel. We stayed 4 nights, had 9 holes on the Academy course on our day of arrival, and 3 rounds on the championship course on subsequent days. The hotel is great for golfers. The rooms were fine, food was excellent and the bar was more like a clubhouse than a hotel. Even more like a club was the Pro Shop come caddie master sited at the end of the building as you exit to walk round to the first tee. They kept our clubs in a room adjacent and all was ready each day as we went down for our tee time. Very slick and customer friendly, even a shoe shine for your golf shoes was available in the locker rooms. The Championship Course is excellent, and being almost totally flat ground, it makes for very easy walking. It offers a very good test of golf and is in very good condition, with a good variety of holes. The Academy 9 hole course was in not such excellent condition but nonetheless it was the ideal warm up prior to taking on the big course. Penina's only fault might also be its biggest plus point. It is quite old fashioned in its architecture, decor and standards, on and off the course. As Henry Cotton’s creation, perhaps that’s not a surprise and, to be honest, this suited us. As middle aged Scots golfers we were there for the golf, a wee drink or two and a decent evening dinner and bottle of wine. Being a little away from any local large town we elected to remain in the resort throughout, perhaps the more adventurous could taxi it to Portimao of an evening if that was your thing. Overall there is much to like and enjoy at Penina and we found it good value for money. The Championship Course at Penina was excellent and with 2 Par 5's to finish, a good score is still possible right to the death. The Resort Course (the 9 hole course) is very poor in comparison to most of the courses on The Algarve. The clubhouse offered a good selection of food and drink in a very pleasant setting, both inside and outside. The staff members are also very obliging. The hotel rooms have been fully refurbished, however they are rather small compared to more modern hotels. The rooms with balconies overlooking the gardens and course are well worth paying that little bit extra for. The breakfasts are dinners at the hotel are exceptional, with numerous bars and restaurants on-site from which to choose which will suit all tastes of cuisine. Overall verdict? It must be a 5 out of 5 and I would personally vote it a 5++ if that was possible! We would readily return to Penina again, but only to play The Championship Course. The course at Penina was excellent – not too difficult but a realistic challenge for all. The clubhouse was very good too, with excellent, helpful staff. The hotel was very good – it’s a pity we didn’t have a sea view! Overall our verdict would be a 4.5 out of 5...there’s always room for improvement! Myself and three friends rated Penina very highly. The course was in great condition; well cared for even though it had plenty of rain on it that week. Lucky for us we didn't get wet; only in the 19th did we manage that! It was a course that even with a high handicap or off scratch you could enjoy. The 19th hole? Well... great atmosphere, very good service and beer chilled to perfection. I must mention the proshop too who looked after us very well seeing to our clubs and shoes after every round. We stayed on a B&B basis and what a breakfast; I can't think of anything that was not there for us! Admittedly the hotel room was a little dated but clean with good facilities and a very good maid service. Would we play here again? We normally try a different course every time we go to Portugal but overall Penina as won all of us over so 2015 could see us back playing & staying at this fantastic resort. Penina is a lovely golf course with a great variety of holes to challenge your golf skills. There is a lovely clubhouse too where you can have a relaxing drink or get something to eat after your game. The hotel is lovely, with good facilities and spacious rooms that are spotlessly clean. I have been to Penina a few times now and would highly recommend it to anyone as I would rate it 5 out of 5 and wouldn't hesitate about returning there. Penina was a superb resort for golf holiday. We were very well looked after from our arrival through to our departure. The Sir Henry Cotton Championship Course was a very good test for all members of our group, with handicappers ranging from 8 to 28. Considering how busy the course was it was in very good condition. We had 2 rounds on this course and 2 on the 9 hole Resort Course which we found a good test as well. The hotel rooms we had were spotlessly clean and the housekeepers kept it that way with daily visits. The food at the Penina Resort was first class too, with numerous bars and restaurants to eat from. We also took full advantage of the huge swimming pool every day. We will definitely be booking again through YGT, and will hopefully return in 2015. Penina is an excellent and challenging course with good features on many holes; never can it be said that it is a boring course. The 9 hole second course is excellent too. The clubhouse is nicely placed after the 18th hole. It is also just for hotel guests and is not therefore a normal stud bar. I've always enjoyed a snack there outside after my rounds. Changing facilities are small but adequate in that most of the golfers will be staying at the hotel. The hotel itself has really good rooms and I would say no difference between the rooms with or without a mountain view. Overall I’d rate Penins as 5 out of 5. I have been back many times and look forward to the next trip there. Golf Course – Challenging for all categories of handicaps and always in good condition. 19th Hole - A friendly atmosphere and a delight to sit out in the sun after an enjoyable round. Hotel - Our room was clean and comfortable. Breakfast was excellent and beautifully presented. The whole facility catered extremely well for the golfing customer. Penina enjoys a wonderful course layout. It is a true classic being a Henry Cotton design and a very good test of golf. The hotel is very accommodating with the staff being very friendly and approachable. The breakfast is an excellent start to the day and gets you in the right mood. It was great to finish the round and then sit outside on the patio area and relax with a few drinks too. Overall I would rate the course and hotel 5 out of 5 and will definitely return in the near future. Penina Golf Resort is the best resort on the Algarve. The Championship Course is second to none and you’re treated like royalty in the hotel. The food in the clubhouse as well as the main hotel restaurant is great too. What more could you ask for? At the time of travel the course at Penina was in excellent condition. I had heard mixed reports before we (my wife and myself) had travelled but we could find no faults whatsoever. The course was well marshalled too so play was kept moving as best as possible. We thought that course has a good layout and as we prefer to walk rather than use buggies, the relative flatness meant this was no bother. The service in the golf shop was excellent with very friendly staff. They were accommodating if we wanted to adjust our tee times where possible and our clubs were looked after the whole time and golf shoes cleaned after each round. Service at 19th was also excellent and we were given complimentary nuts and olives each evening. Atmosphere was good but fairly quiet, with the crowd consisting really only of golfers who had just finished their rounds. We found the hotel to be excellent. We had a room with a pool view which I think makes a major difference. The breakfast was really excellent and could set you up for the whole day! Hotel drinks and meals could be regarded as pricey so we had most evening meals in nearby Alvor but always had a couple of drinks at the hotel on returning each evening. I would rate our trip as a 5 out of 5. We have already booked through yourgolftravel to return to Penina again next year and we hope to find everything as good as this year. Having heard all the hype surrounding Penina, I thought surely it can't be that good and approached my golf holiday with a little trepidation (after all one man's treasure can often be anothert man's trash! )...however...I need not have worried. As they say there's no smoke without fire and Penina, from the hotel to the golf course, really deserves its plaudits! 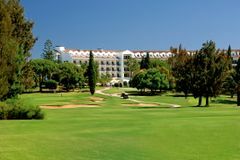 Sir Henry Cotton's Championship Course is certainly befitting of its lofty repuation as one of the best in the Algarve. The course is old school and makes you think your way from tee to green. Rather than just reaching for the driver on every hole and bashing away, sometimes the more prudent choice is to lay up in order to avoid the intelligently placed bunkers and water hazards, or to leave yourself a better angle to the green. Golfing purists will really love this one and dare I say so would those new to the game or with high handicaps. Dining options at the resort are more than adequate and the hotel is also well placed to allow guests to take affordable taxis to and from local towns to sample the local culture and cuisine. All in all, when it comes to the stay and play golf holiday in the Algarve, Penina takes some beating and I for one am looking forward to a return. The hotel offers everything a golfer needs during a week away in the sun. From the accommodation and dining options to the sports facilities and the lavish spa, everything is right on point and certainly of five star quality. The Championship Course is epic. It took only for me to reach my ball in the 1st fairway to realise this is special layout. It reminded me of the great courses if the Surrey sandbelt and what more could a golfer ask for than a Wentworth style course in the heart of the sunny Algarve? Not much in my opinion and considering this was the 1st course to be built in the Algarve, it really has stood the test of time and still offers a great challenge of shot making and course management. The greens were top class which is always important and the practice facilities are unbelievable. I'm not usually one for beating balls on the range but I found myself doing just that before each of my rounds, such are the quality of the facilities. As ever, Your Golf Travel nailed it with the preparations and arrangements and considering that, as well as the value for money on offer, I wouldn't hesitate recommending both yourselves and Penina to anyone...even the pickiest of golfers! Really tough course. Greens were slow. Bunkers not racked. We waited every hole ( I guess we had buggies)But overall a great experience. Had a great time playing the courses available. Great courses really enjoyed playing them. Penina is hard to fault as a golf course, though the expediency of the transport there and back from the airport deserves special mention, literally ran like clockwork. Some brilliant holes and great layout, requiring straight and long off the tee. The rough is quite short but the ball sits down in it. After rain this rough became was very lush and hard to play from, so finding the fairway is a must. All for hire hand trollies are old fashioned pull type, these are hard going in the rough. Hiring an electric trolley on site costs 20 euro /round. Greens were fast and true. Before rain it was very hard to stop the ball on the greens. Expected round time is 4.5 hours. We had rain 3 out of 6 days in first week of March. Not in great condition, the fairways were patchy and covered with lots of leaves and debris from the surrounding trees. Bunkers had very little sand in them. Greens were in good condition, true and fast. Very tight off some tees, this course would be great if it was maintained to the same standard as the Championship course. This is a 9 hole course with 2 sets of tees. We were booked to play this twice but staff allowed us to change to Championship course for our 2nd round at no cost. Average rating for difficulty of the coarse is a bit dismissive from a club golfer, however off the yellow tees a goodish score is doable, I think you can see why the pro's do quite well there, if you're not on your game though take a ball scooper with you. Was told it was good but was dissapointed with the general condition. A littel tired and untidy,ponds and ditches need attention. Tees and greens good. Setting off at 10th was difficult, narrow fairways. Would have been better setting off at 1st. A good coarse for par 3s, very narrow with plenty of over hanging trees. Got held up on several occasions, because you go around twice. Really tough after the rain. Excellent golfing challenge and highly recommend a visit. As a 15 h'cap golfer I found the course a very good challenge. Overall condition of course was very good. I can understand why it held the Portuguese open. I would strongly recommend visiting and playing. Very good course, great greens and fairways. Great course, a must hit the green as they are very good and hold the ball well. If playing late watch the bar closing as the shut at 7pm. The amount of pitch marks on the greens is a disgrace. Overall, the courses are ok but the condition of the greens and the lack of managing slow play are real problems which would make me think twice about a return visit. A good test, albeit only nine holes with two tees on each hole. Not bad for a par three until we got behind a five ball who were very slow with no idea of golf etiquette. No particularly memorable holes. About the best part was good quality lunch available afterwards. Staff on course were the least helpful of the three courses we played. This was a very pleasant and non-challenging course to play on our last day. With wide nicely kept fairways, good greens and little to frighten the high handicappers. 9 holes are played twice from different tees but the difference is only a few yards from the same teeing ground; essentially, it's a 9 hole course payed twice. This is a beautiful classically designed course and a very good but not fiendish challenge, especially for high handicappers. It is quite flat but plenty of well-placed bunkers and water require you to think your way round. The greens were a disappointment in as much as the surfaces were soft and easily damaged as evidenced by the numerous pitch mark scars. I was very disappointed by the number of golfers who had not bothered to repair their pitch-marks. Presumably they were the ones who hadn't bothered to rake the bunkers even though there were plenty of rakes. The bunkers would benefit from some fresh sand. What I found most off-putting on all three courses was the constant loud noise of twin-engined aircraft taking off and landing as they serviced the sky diving that lasted all day. The course is immediately adjacent to this airfield. The 9 hole course weaves in and out of the championship course. The fairways and greens were patchy so its only real value was to practice your shots for playing the other two courses. We played on the Championship course three times. Conditions of the fairways and greens was good. We had a range of golfing handicaps from 8 to 28 and the course catered for all abilities. As a second course the Resort was fine. It is a challenge for the less experienced golfer and being only 9 holes it is easy to come off if struggling after one circuit! There was not the same amount of traffic on the Resort compared with the Championship course. The Championship course was in excellent order considering the heat. Not a lot of run on the fairways as there was a good covering of grass ensuring a great lie. Speed of play was dependent on the ability of the groups in front! Needs much work to restore it to Championchip standard. Very very busy so difficult to play properly. It is a great design and calls for good shot making but waiting for every shot does not help.